The eleven Pacific Islands Forum countries participate in the scheme, which has been operating since 2007. The “rewarding” of different nations based on the performance of their workers is not an official policy, but Salato’s comments would indicate that it happens in practice. The scheme has had something of a checkered history despite its short existence. Conducting field work with RSE workers from Vanuatu in 2008 for research on migrant workers, Swedish political scientist Lina Ericsson uncovered a number of domestic and international labour law violations (listen to an interview with Ericsson at http://bit.ly/1aJ36fO). The Council of Trade Unions has criticised the fact that employers can make deductions from workers already low wages, often for private health insurance, as despite working and paying tax in New Zealand RSE workers are not covered by ACC. There have also been issues around exploitation of workers not just by employers but from accommodation provides, who have provided substandard living conditions or demanded unreasonable rents. With the threat of deportation RSE workers behaviour is strictly policed, even in their own time outside work. Samoa’s prime minister Tuilaepa Sa’ilele Malielegaoi recently announced that villages would be blacklisted from participating in the scheme if their members were sent home. The Immigration NZ manager of the scheme, Matt Hoskin, told The New Zealand Herald that “Only a very small minority [of workers] are deported each year.” Arguably many of the offensives that lead to deportation would not result in a comparative punishment for New Zealand citizens. While Samoa’s village blacklist is a recent development, many of the other issues have been resolved and the scheme is seen as a net positive for Pacific Island workers. This is the reason for Salato’s jubilation. However a few extra places on the RSE scheme falls short of the labour mobility agreement that the Solomon Islands and other Pacific countries want to see. Speaking to Islands Business magazine, Robert Sisilo, Solomon Islands Trade Negotiations Envoy and Lead Negotiator for Forum Islands Countries, said that one of the main demands by FICs is to have labour mobility as an integral part of PACER-Plus so that it becomes legally binding. According to Sisilo the FICs would also like Australia and New Zealand to increase the number of eligible workers under their labour schemes and also extend their coverage to include as many sectors as possible. 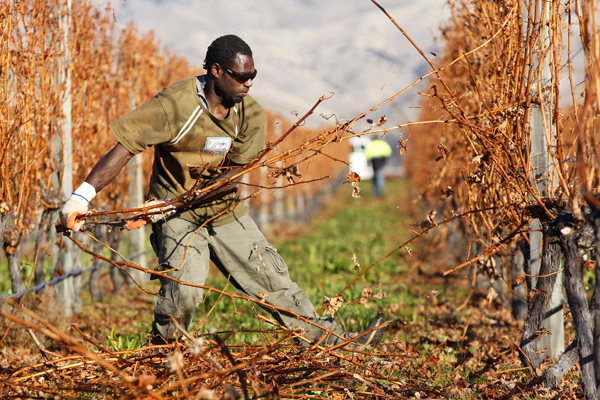 Though it is sometimes framed as ‘aid’ to the Pacific, New Zealand’s RSE scheme exists mainly as a way to aid employers with a cheap migrant workforce. While Wong spoke of the extra places providing a “good income stream” for workers and “the opportunity to experience life in New Zealand” she also noted that “Importantly it provides our agricultural sector with access to a high quality labour source”. That of course is the real reason for its existence. When Samoa’s Malielegaoi met with New Zealand Foreign Affairs Minister Murray McCully in August he raised the same issues as Sisilo, and also expressed concerns that the scheme may see changes if there is a change in government next year. Two weeks prior to the meeting between the two, Labour’s primary industries spokesman Damien O’Connor had publically aired opposition to increasing the amount of places on the scheme. Looked at in that context, Samoa’s village blacklisting appears as a desperate measure to curry favour with New Zealand in what Barret Salato’s words imply is a tough completion for the right to work.